Rejoice, O Virgin Mother of God, thou giver of milk! Gladden us with the grace of thy Son! This Akathist-pure and beautiful in its simplicity-was composed in honor of the unique Wonderworking Icon, "the Milkgiver," treasured in the Serbian Hilandar Monastery on the Holy Mountain. The Theotokos is depicted breastfeeding Christ, a poignant model for mothers nourishing their children. This maternal image is woven throughout the text, as the Mother of God is our "sheltering wing," "protection for our little children," "support of families of the faithful," and "nurturer of the young and weak." She is the nurturer of all, for her milk "noetically poureth forth immaterial gifts, nurturing the hearts and souls of the faithful." 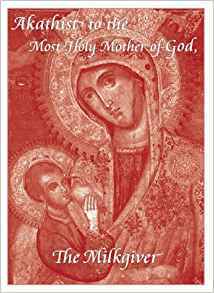 This English version is translated from Serbian and printed with the blessing of Hilandar Monastery. A fitting gift, especially during the season of Christ's Nativity. Inner pages include several full-page icons, and the entire book is fully adorned with a festive design.